National Energy Efficiency And Conservation Authority (NEECA) Islamabad. 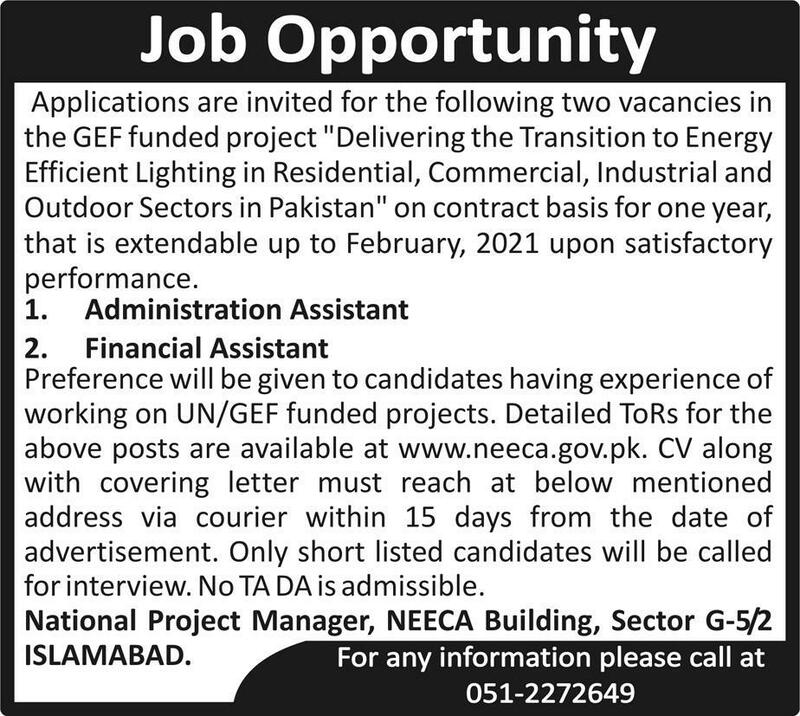 Applications are invited for the following two vacancies in the GEF funded project "Delivering the Transition to Energy Efficient Lighting in Residential, Commercial, Industrial and Outdoor Sectors in Pakistan" on contract basis for one year, that is extendable up to February 2021 upon satisfactory performance. Preference will be given to candidates having experience of working on United Nation UN/GEF funded projects. Detailed ToRs for the above posts are available at www.neeca.gov.pk. Send CV along with covering letter must reach at below mentioned address via courier within 15 days from the date of advertisement. No TA DA is admissible. NEECA Building, Sector G-5/2 ISLAMABAD.